Silly me! 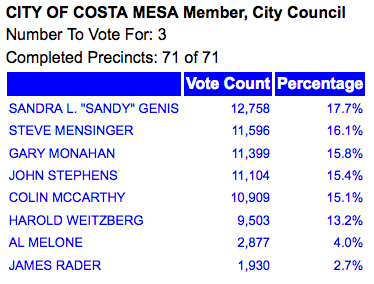 I though Neal Kelley might give his great team some time off for the 3-day weekend, but no - his crew worked again today and gave us an update on the election results shortly after 5:00 p.m.
Sandy Genis gained 1,120 votes and widened her gap over Steve Mensinger to 1,355 votes. 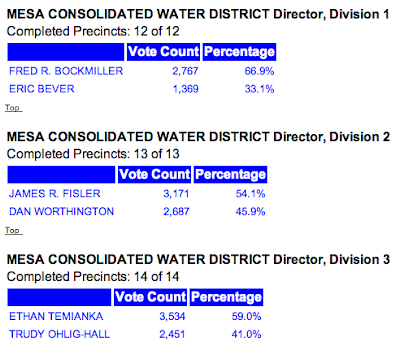 Mensinger remains well ahead of Gary Monahan by 264 votes. Monahan gained 660 votes, however lost ground to John Stephens, who gained 965 votes and is now only 190 behind him for that critical third seat. There are only 4,757 ballots remaining to be counted. 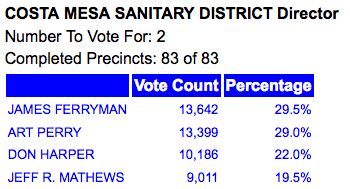 Colin McCarthy is 284 votes behind Stephens. 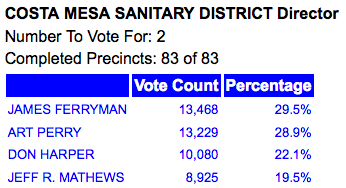 Harold Weitzberg, Al Melone and James Rader continue to trail the field. 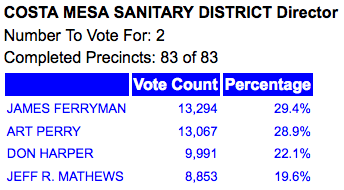 The gap between the incumbents, Jim Ferryman and Art Perry and the two contenders, Don Harper and Jeff Mathews, continues to widen with 5,086 votes left to count. 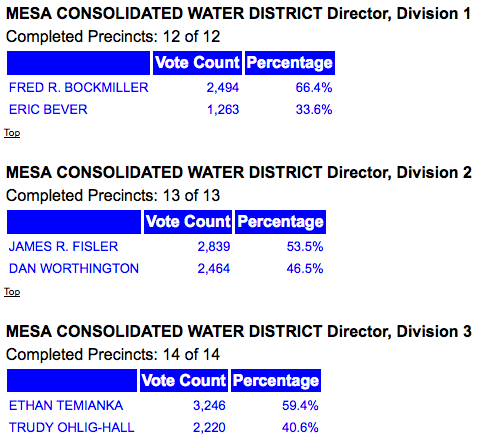 The results of the MCWD races are virtually final now. 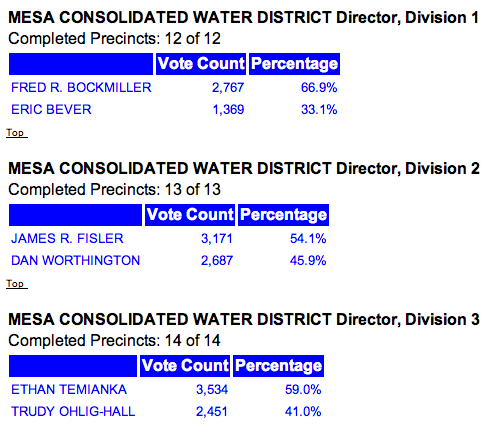 With only 741 votes remaining to count Fred Bockmiller has soundly trounced Eric Bever. 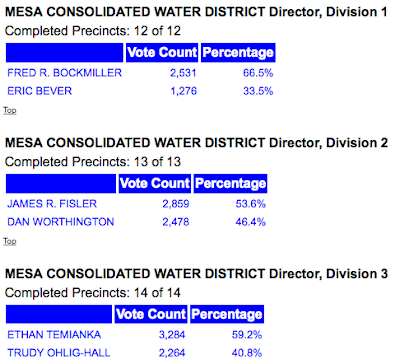 With 811 votes remaining to be counted, Jim Fisler is well ahead of Dan Worthington. 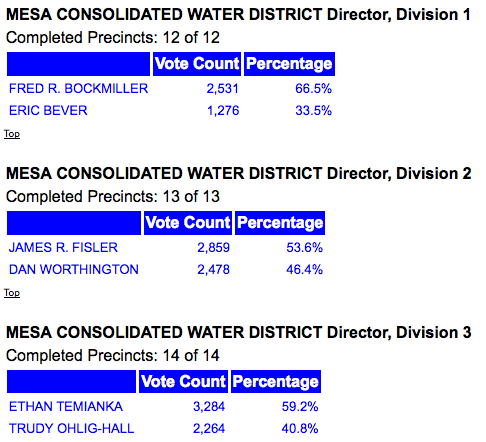 Even though there remains 1,005 votes to be counted, it appears that Ethan Temianka will beat incumbent Trudy Ohlig-Hall. THIRD CM COUNCIL RACE UP FOR GRABS! 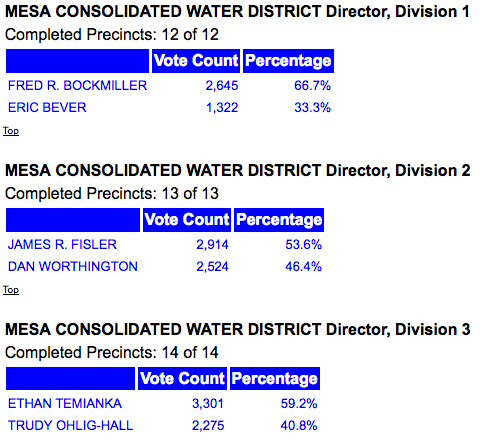 It's impossible to predict what will happen in the Costa Mesa City Council race until the last vote is counted and the Registrar certifies the race. With Stephens gobbling up a third of his deficit behind Monahan in one day of counting, and with more than 4700 votes remaining, you just have to say that race is up for grabs now. 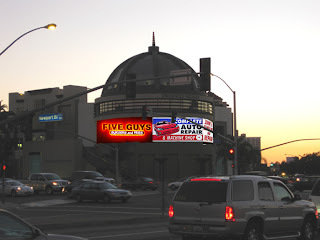 The Costa Mesa Planning Commission, at it's meeting on Tuesday, November 12, 2012, will address a request from the new owners of The Triangle - it used to be known as Triangle Square - for approval to hang huge movable vinyl signs on the carcass of the renovated building that represent advertisers NOT associated with the building. The image at the top is what one artist thought it might look like with LEDs. The current proposal would forbid lighting, but not tackiness. Yes, after withdrawing a similar request that involved LED lighted signs earlier this year and spending who-knows-how-much money on the current renovations, Greenlaw Partners are back with a request to plaster signage at two locations on the building - signage space that would be rented out to non-resident advertisers. You can read the Daily Pilot article on this issue HERE. The current agreement apparently calls for signage that only represents tenants of the star-crossed shopping center. You can read the staff report HERE. The owners managed to circumvent the spirit of that agreement when they rented a closet to Van's which entitled them to have a huge banner stretched around the corner of Newport Blvd. and 19th Street for folks coming out of the SR-55 ditch to see as they wait for the traffic signal to cycle - sometimes two or three times - before heading on down to Newport Beach to spend their money. Because of the pro-developer orientation of the current Planning Commission and City Council majority, opponents feel this may just be the tip of the iceberg when it comes to loosening up the The City's sign ordinance. If these large, overpowering signs are permitted here - in one of the primary gateways into our city - they are concerned about what will happen throughout the city later. The Planning Commission meeting begins at 6:00 p.m. Tuesday in council chambers at City Hall, 77 Fair Drive. You can read the entire agenda HERE. This item is the final one on a fairly short agenda, so those wishing to address this before the commission are advised to arrive early. Each speaker will have 3 minutes to address their concerns following the staff report presentation. The Orange County Registrar of Voters has updated the results of their counts shortly after 5:00 Friday afternoon. Those new numbers are shown below. The next update will be at 5:00 Tuesday - Monday is Veteran's Day. The percentages remain about the same. 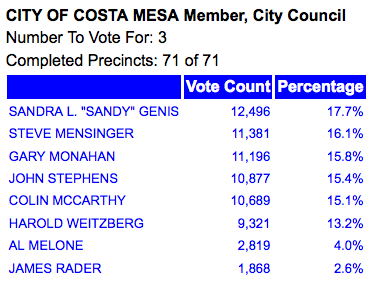 Genis extended her lead on Mensinger. Stephens gained another 22 votes on Monahan for the critical third spot. 7,143 balots left to count. 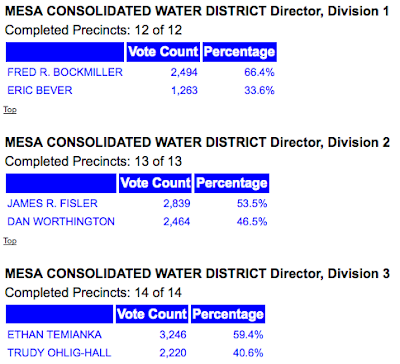 It looks like the non-candidate candidates, Melone and Rader, may total over 5,000 votes when the counting ends! Relax, have a nice weekend with this perfect fall weather and just wait for the next bombshell to drop. We all laughed at the drama that took place at the Registrar of Voters office yesterday. As each of these kind of events take place we chuckle and think, "Well, it can't get any stranger than that!" We were wrong. Tonight Orange County Register columnist and running buddy of the current power elite in Costa Mesa, Frank Mickadeit, published a fascinating column, HERE, in which he reveals "details" of the Great P.I. Stalking Righeimer event last summer. According to Mickadeit, the Private Investigator, Chris Lanzillo, confided to him Thursday that his mission on the day he tailed Costa Mesa Mayor Pro Tem Jim Righeimer from Skosh Monahan's pub to his home after contacting the Costa Mesa Police Department and reporting Righeimer as a probable drunk driver was actually to observe councilman Gary Monahan in some kind of an unsavory liaison with a planted operative at his pub. His goal was to "get dirt" on Monahan. I'll let you read Mickadeit's story yourself and form whatever judgments you might have on your own. However, a couple things bother me about his story. IS LANZILLO LYING OR JUST NOT VERY GOOD? He says Lanzillo told him his assignment was to catch Monahan in a compromising position with the bimbo in the "low-cut top", yet - apparently on a whim - he follows Righeimer out on the chance that he might catch him driving drunk. Really? This just doesn't smell right. Either Lanzillo is lying or he's the least reliable P.I. I've ever heard of! FEAR OF THE DISTRICT ATTORNEY? And then there is this comment attributed to Lanzillo after he said he wouldn't talk with the District Attorney's office because, "I can't trust them. I'm not going to talk. They are all affiliated with each other." If there's even a snippet of truth to that paranoid statement, then we all should be just a little nervous. Mickadeit includes this sentence in his closing paragraph: "Until we find out who was behind this, the whole union-based, anti-Measure V/anti-Righeimer faction is smeared." Well, I've been an outspoken critic of Righeimer and his bogus charter from the instant he proposed it. 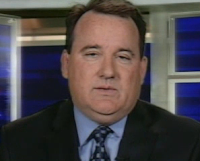 I assume Mickadeit includes me in his much-too broad brush indictment and resent it very much. For him to assign guilt to anyone, or any group, before any kind of investigation has been completed is sloppy journalism, irresponsible and just plain wrong. But, then, I guess I shouldn't assign my ethical standards to a guy who spends a lot of time bellied up to Monahan's bar, then writes these kind of pieces. The readers should take this article with a grain of salt, even though the information it provides may be the tip of a very insidious ice berg of misbehavior in our city. If Lanzillo was, indeed, hired by someone or some organization to perform the kind of surveillance and entrapment described in Mickadeit's column it, while perhaps not illegal, is despicable and unacceptable in the politics of our city. I hope the District Attorney or, as a friend suggested, the Grand Jury investigates this situation and gets to the bottom of it regardless where the investigation takes them. After another long, hard day of counting ballots, at 5:00 p.m. Thursday the Orange County Registrar of Voters updated the numbers on the General Election. The next update will be at 5:00 Friday evening. You can visit the Registrar of Voters site HERE to view other races of interest. Each Costa Mesa council candidate picked up a few votes since yesterday. 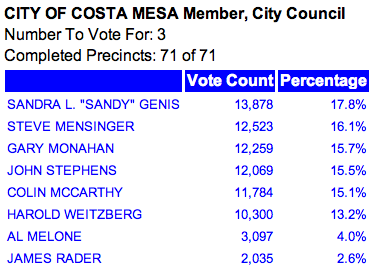 Sandra Genis gained 99 votes. 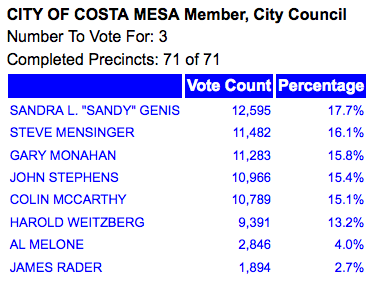 Steve Mensinger gained 101 votes and trails Genis by1,113 votes. 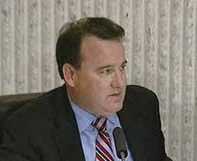 Gary Monahan gained 87 votes and trails Mensinger by 199 votes. 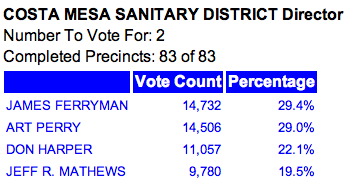 John Stephens gained 89 votes and now trails Monahan by 317 in the race for the 3rd seat. 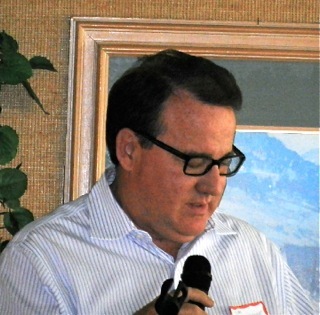 Colin McCarthy gained 100 votes and trails Stephens by 177 votes. Harold Weitzberg gained 70 votes. Al Melone gained 27 votes. James Rader - who didn't run at all - gained 26 votes and looks like he will end up with more than 2, 000 vote after mounting NO campaign at all. Astounding! FILE UNDER "STRANGER THAN FICTION"
Just when you think the Costa Mesa political drama can't get any stranger, all of a sudden some new event disproves the theory. Today, for example. As I understand the facts, Katrina Foley and John Stephens were having a cup of coffee and discussing the election at a local Starbucks before heading up to the Registrar of Voters headquarters in Santa Ana to see how the counting of absentee and provisional ballot was going. They saw Jim Righeimer, also apparently in need of caffeine fortification - or maybe a Diet Coke, I don't know - so they all exchanged pleasantries. I use that word guardedly, since there has been no small degree of friction between Foley and Righeimer for months - years, actually. Then they went their separate ways. Once at the ROV offices Foley and Stephens saw Colin McCarthy also there and also apparently to see how the vote-counting was going. He apparently called in reinforcements because he feared superior numbers on Foley/Stephens part might somehow influence the Registrar's staff to miscount ballots! Shortly a squad of fifteen or so zealots arrived. Seeing them arrive, Foley sent out HER alert and very soon thereafter about 30 folks supporting Stephens showed up... sounds like a scene straight out of Westside Story, for goodness sake! For dramatic purposes I'd like to tell you there was rancor and jostling between the factions - but I can't, darn it! Everyone apparently behaved appropriately, although not without more than their fair share of paranoia. Finally, after a goodly amount of time passed, one of each faction actually spoke with the other and determined that neither group was there for nefarious purposes, so they all decamped the ROV headquarters and went their separate ways, leaving Neal Kelley and his crack team alone to do the job. NO CAMERA OR MICROPHONE GOES UNLOVED! A sidebar - Righeimer was on the radio with Bill Carroll on KFI 640 AM immediately after that - he must have been sitting in the parking lot - crying the blues about his bogus Charter scheme going down in flames. He blamed it on the hundreds of thousands of "union dollars" that were used to fight his plan to takeover the city. We all have known that he's a loser, but now we know he's a BAD loser, to boot.